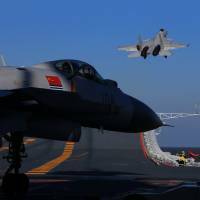 China’s first and only aircraft carrier battle group has carried out its first-ever live-fire drills — a show of force amid ongoing tensions in the region — the Defense Ministry announced late Thursday. 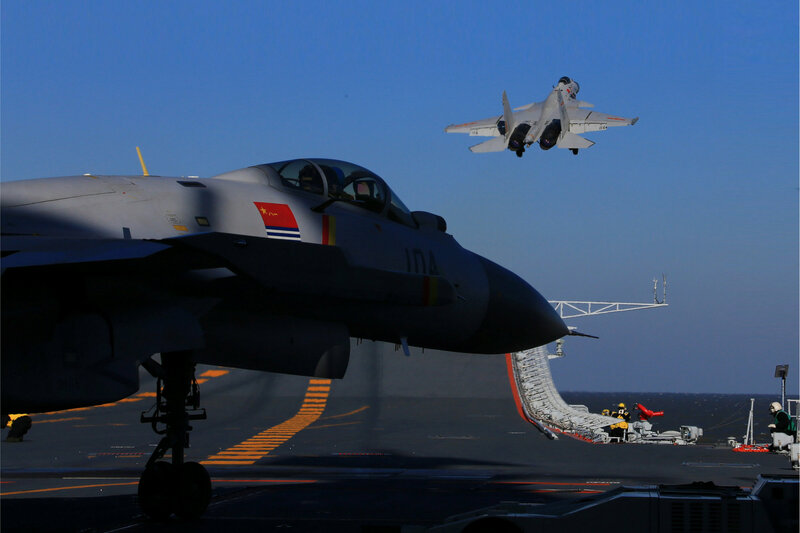 The drills, which took place “days earlier,” were conducted in the Bohai Sea and involved the Liaoning carrier and dozens of ships and aircraft — including J-15 carrier-based fighter jets carrying live ammunition. The Liaoning performed various drills with several destroyers and frigates, involving scenarios such as reconnaissance, aircraft interception, sea attacks as well as missile defense. Multiple groups of J-15 fighters fired air-to-air and anti-ship missiles at targets during the exercise, the People’s Liberation Army Navy said in a statement. Video of the J-15 fighters firing missiles were broadcast on China Central Television, the first time images of J-15 live-fire exercises have been shown to the public. The statement quoted top officials from the navy’s training bureau as saying that the event had been planned as part of carrier’s training schedule and was aimed at verifying personnel and weapons capabilities. Rear Adm. Chen Yueqi, commander of the Liaoning carrier group, called the drills a “milestone” for the unit. The announcement of the recent drills comes on the heels of a report released Wednesday detailing a “significant” build-up by China of anti-aircraft and anti-missile systems on all seven of its man-made islands in the South China Sea’s Spratly chain. That revelation came despite a pledge last year by Chinese President Xi Jinping not to “militarize” the islands in the waters. Beijing claims most of the strategic waterway, through which more than $5 trillion in annual trade passes. Brunei, Malaysia, the Philippines, Taiwan and Vietnam all have rival claims. China has reclaimed more than 1,280 hectares (3,200 acres) of land on seven features it occupies in the South China Sea’s disputed Spratly chain. The U.S. says the man-made islets give it long-term “civil-military” outposts from where it can project power. The U.S. has conducted what it calls “freedom of navigation” operations in the waters, much to the chagrin of China. The last such operation came in October. The recent carrier drills are likely to put more muscle behind Beijing’s moves in the disputed South China Sea — and beyond. The Liaoning, which was purchased as an incomplete Soviet-made hull from Ukraine in 1998, was commissioned in 2012. China is also in the process of constructing its first indigenously built carrier. The Defense Ministry said in October that work was proceeding smoothly, with the hull having already been assembled.